This recipe was in yesterday’s LA Times “Food” section and I just knew I had to make it right away. I don’t think I’ve ever made a recipe from the newspaper the day it came out, but I was inspired by the baby artichokes we had in our fridge at home, leftover from a fritata we made earlier in the week. Shockingly, this recipe uses none of our CSA ingredients – we’re picking up today and honestly we’ve used everything up except for some dill. 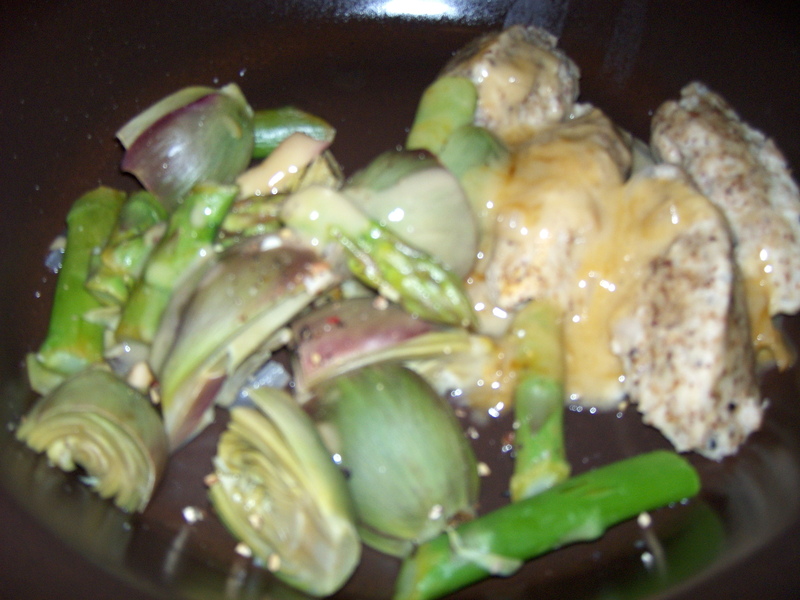 The artichokes are from the SM farmers market, though the asparagus and mushrooms were from Trader Joe’s. Honestly, this recipe may be one of the best things I’ve ever made at home. It’s not a simple recipe, but, as long as you follow the steps and move quickly, it’s pretty fool proof. They do divide the recipe so you could make the quenelles and blanch the veggies the day before if you want to make this for a dinner party. We divided the recipe in half and it was just perfect for 2 people. P.S. Apologies for the blurry photo – all the photos I took of this dish turned out blurry for some reason. Not much of a recipe here. Turnips and carrots tossed in olive oil and then baked until cooked through and golden. Served with a butter lettuce salad with radishes and fake chicken strips which were kind of weird. Enter your email address to subscribe to this blog and receive notifications of new posts by email (don't worry, this isn't spam, and I don't think I even get to see your email address).